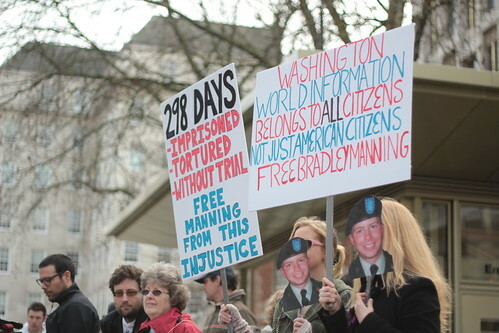 Around 100 protesters, including some who had traveled from Scotland and Wales, met outside the US embassy in London on Sunday to pledge their support to Bradley Manning and stand up against what is happening to him at the Quantico marine brig. They were joined by speakers Peter Tatchell, Bruce Kent, Loz Kaye, Ben Griffin, Giorgio Riva and Didi Rossi, Ciaron O’Reilly, Naomi Colvin and teenagers from Pembrokeshire in Wales. The London event was well-reported in major media, including the Daily Mail and BBC Wales (here and here). Indymedia produced an excellent report and further photos from the event are available here and here. 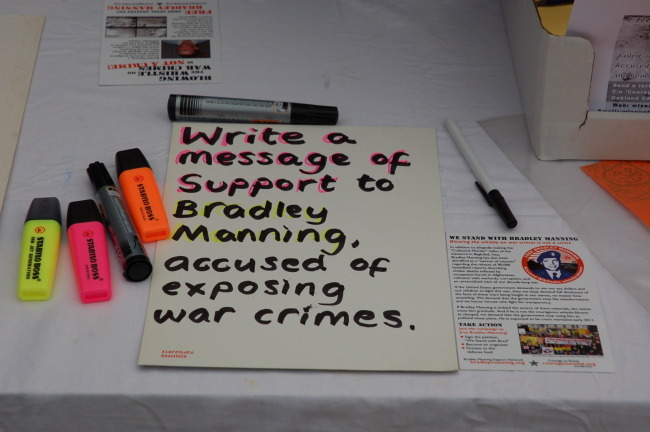 12 people came from the Welsh county where Bradley Manning went to school and his family still live to the London demo. Three girls who were contemporaries at school with Bradley said they felt they had made a real difference. The group had never spoken publicly before: Tilly said the last time she tried was at school and she went to pieces and was laughed off the stage. Chris May came with his teenage daughter. He replied to an internet attack on the campaign and found he was in dialogue with a senior military officer in USA who said ‘We are the Alphas of the Alphas.’ The long dialogue ended with the officer thanking Chris and saying he had made him rethink his position, but could not continue because he was being deployed within hours in Afghanistan. Chris urged campaigners to communicate with people they do not usually speak to, and to put themselves in their shoes. The rally was attended by 100 people including media. The group commented that those attending were very serious and motivated, this was not a rent-a-mob situation. There were many speeches and a Bradley actor in manacles. The rally was organised by an impromptu group including the Welsh group who arranged things with the police. “A very well organised event” commented one of the officers at the end. A full report, including photos, is available on Indymedia. Further images are available here. #March20 proved to be an inspirational Sunday afternoon, but we are not planning to stop there. This Thursday, 24 March, there will be a public meeting in Wales. Further events will be reported on this website in due course. We’re also delighted to have pupils from Bradley’s former school coming to Grosvenor Square to join us. 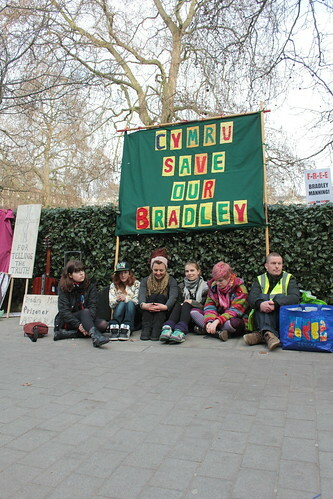 London is a marathon journey from Pembrokeshire yet these teenage girls feel so strongly about what is happening to Bradley that they are giving up their weekend to come and address the crowd. Please join us there. Our facebook event page is here and we’ll be meeting on Grosvenor Square at 2pm. The nearest tube stations are Marble Arch and Bond Street.